On Saturday, May 19th, I decided it was my day to garden. I could wait no longer! I spent 2.5 hours delighted to be gardening and although I definitely overdid myself, it was wonderful to be able to overdo. I came in and while I rested I wrote a post about My Designated "I Can Garden" Day. Oh, how vitalizing the feel of the earth can be. Since then I've done a bit of pruning but painting is what's been on my mind. The trim around the two deck doors needed it. I like to paint before things start looking bad. It's been on my list since April to get done, so was very excited to have it finished. Next area will be the trim around the doors and windows on our screened porch. I love the way a fresh coat of paint looks! It really makes me smile! A month ago Randal put in some Purple Homestead Verbenas (link shows closer photo of the flower from plant we put in last Fall) in the backyard viewable from the breakfast window. We had to cut down a Black Willow tree that the birds had planted about 8 years ago after one of the windy storms had blown it sideways. It never straightened back up and the long branches were leaning towards the house and providing too much shade for all the flowers planted beneath it. 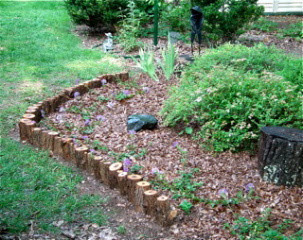 I'm not one who can take trees down without a really good reason, so now having two, I finally worked up enough 'umph' to tell Randal to cut it down since we could use the double trunks to cut into small logs to make a border around the newly planted flowers. I like what he did. Not being able to be involved in every detail of our gardening plan with the temporary heart challenges, Randal has had a chance to get a lot more creative. I did some pruning of things while he was working on that. We wanted to do something different for the holiday weekend, so we headed over to Richmond, Virginia, to visit a few places. Good intentions are great, but reality was that after the first one, I was pretty tuckered. I am determined to keep fun in life during this season of recovery, but it is frustrating not to be able to do all you want to do. Tuckahoe was the visit we accomplished. 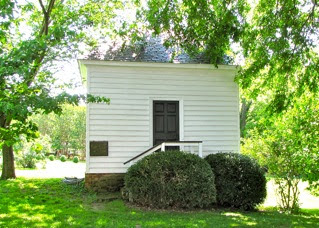 It's was Thomas Jefferson's boyhood home. 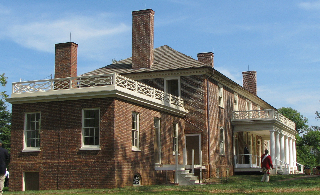 It is considered by architectural historians to be the finest existing early 18th century plantation in America. They didn't offer tours of the home unless scheduled but that was just fine with us since we usually only visit the outdoor areas and gardens when we go to historic estates and plantations. I love the architectural features of the homes though. There sure are a lot of them in Virginia. View photo album on Tuckahoe Plantation. Thank you for your prayers for my continued healing. I am still amazed at how God works and how much encouragement He has given me during this season of life. Prayer is a powerful force, as one of the articles on the blog indicates from research: Medical Proof of Healing Power of Prayer. On Tuesday this week I hit an all-time low on my weight which indicates I'm losing water. I actually need to gain flesh pounds, but don't want the water pounds. My previous low over a month ago was 121.4 and Tuesday I hit 121.2, so I'm excited. When I saw the doctor at the end of January I was around 141, so that's 20 lbs. of water, although I do need to put on some actual flesh/muscle weight. 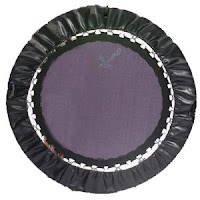 I'm still rebounding on my ReboundAir mini trampoline (the link is to Amazon where it's a bit less than the ReboundAir website). The one recommended by doctors and NASA is definitely different than the cheap ones I tried out. I only do 5 minutes at a time, but it's gradually increasing my muscle tone. When I say rebounding, I refer to doing the "health bounce" which keeps your feet totally on the mat with a mild bouncing by using your knees. Here's a great article: Do Your Cells Need Exercise? Rebounding, going against the law of gravity, opens up each cell and keeps the lymphatic system flowing for two hours. It's helping with the sodium retention since I've been eating almost triple of what I was eating. There are many benefits to rebounding, as you can see from this article: Benefits of Rebound Exercise. The breathing challenge I have seems to bother me the most mainly because I feel like it is an infection or something other than just related to the congestive heart failure. I had that "message" in my spirit almost a month ago and began taking various immune formulas I had on hand and lung herbs. It seemed to get better, but wasn't doing as much as I wanted so I did not continue after a couple of weeks. What I realized a couple days ago is that I received the "message" about infection, but didn't take the time to ask what was best to use for it. Duh! That's me! Always rushing ahead on the journey. So, when I was so sure that it had something to with infection, again, I had the sense to ask what to take and "heard" Yarrow. When I looked up what Yarrow is used for I was amazed to find pleurisy as one of the main things. One of the things I was told by the doctor was that I had pleural effusions due to the heart failure. I could sure let my head spin with all the many medical terms and prognoses, but I know that only The Word tells the truth and that my body was built for healing by the Great Physician, so I certainly won't rely on all the medical jargon and doom and gloom. I am taking the Yarrow and will report in the next newsletter whether that took care of ALL of the breathing problems or not. I believe God will fill in where I'm missing, so all is well. 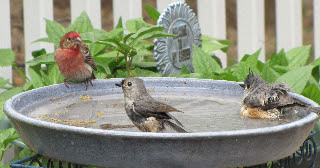 Our birdbath has been quite the gathering place. The birds line up on the deck rail and wait their turn. Well ... some of them do. The finches get to fussing quite a bit, but the titmice and chickadees are very patient. The cardinals win hands down on splashing the most water about. Apparently our two huge bullfrogs wintered over some place else or left early in the Spring for the big pond across the street. We have such a small pond that I've been surprised that bullfrogs took up residence, but the big pond across the street had to be drained for some work so I guess at least we provided refuge for them. However, not with much great joy since bullfrog appetites are voracious! We had oodles of bullfrog tadpoles in the pond when we took some leaves out in the Fall and that was after the big pond was back in shape, so we figured it could use them. We carried them over there. Maybe that caused the adult bullfrogs to leave since they do eat their own. Regardless, I was wondering what kind of frogs we'd get now. 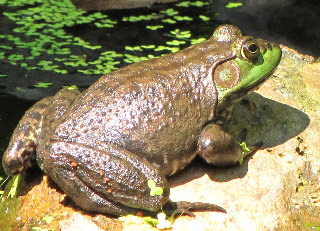 We used to have Green Frogs, which look very much like the American Bullfrog. 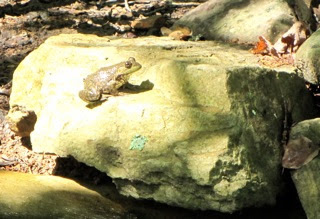 About a week ago I finally saw a frog sunbathing on the rocks by the pond. I took photos so I could zoom in and see what kind of frog it was. It looked rather small so I was thinking we had our Green Frogs back. However, it turned out that it was just a young American Bullfrog. We didn't get all of the tadpoles out of the pond. It didn't seem fair to do so. I guess this is the result. The way you can tell the difference is that the Bullfrog has a ridge that extends from the eyes around the tympanum and the Green Frog's ridge runs down its back. What's a tympanum? The tympanum functions in a similar fashion to our own eardrum. It is composed of non-glandular skin and unlike our own eardrum it is situated externally on the frog. There is a bone attached to the tympanic membrane which also attaches to the oval window of the inner ear. When sound waves strike the membrane vibrations are transferred via this bone to the fluid of the inner ear. 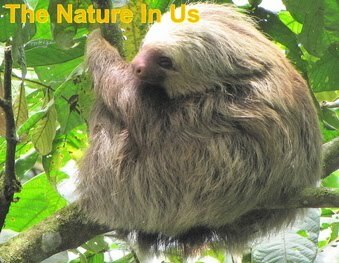 This in turn causes receptors within the inner ear to be stimulated, sending a transmission to the brain for processing. So it's easy to tell the bullfrog from the green frog. You can also tell a male from a female by comparing the size of the eye to the size of the tympanum. When the tympanum is much larger than the eye, it's a male. When it's about equal, it's a female. I hope you're taking the time to be outdoors and view all that God has given us not only for pleasure, but to know Him through what He has created. I know our garden and woodland habitat views has a lot to do with my healing.